Before lunch, I posted on a new phytools function, threshBayes, in which we can use Bayesian MCMC to sample evolutionary model parameters & liabilities on the phylogeny from their joint posterior distribution using MCMC. 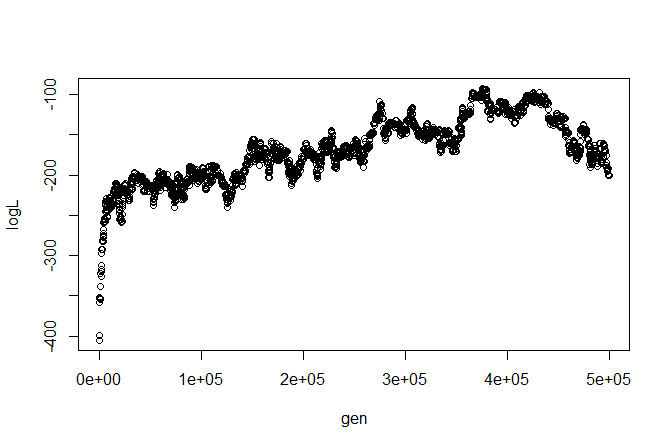 For more information on the threshold model in phylogenetics, see Felsenstein (2005, 2012) and my previous post. 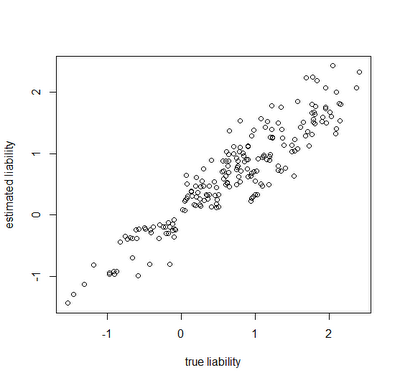 Here, I'm going to illustrate simulation & estimation under this model using phytools & threshBayes in R.
Now, we can substitute one of these characters (say, trait 1) for a binary trait evolved under the threshold model, setting the threshold to +-0. t4 0 . . .
Now we are ready to run our MCMC. We'll just use the default control parameters and priors. Note that this may take some time - certainly at least several minutes even on a fast computer. The object returned by threshBayes is a list containing the posterior sample for the parameters of the evolutionary model and the liabilities at the tips. Note that for a continuous character liabilities are not sampled (they are treated as known), but these are still given in the posterior sample matrix. Also - we fix the rate of evolution at 1.0 for the liability of our discrete character. This is because don't actually have any information about the scale of our underlying liabilities, and the probability of switching back and forth between states on either side of the threshold is independent of the Brownian rate of evolution of liability (this is probably better explained in Felsenstein 2012). These are really close to the generating parameters (particularly for σ2 and r). To be fair, this was part of my motivation in using a "large" tree of 200 taxa, even though run time is considerably longer. 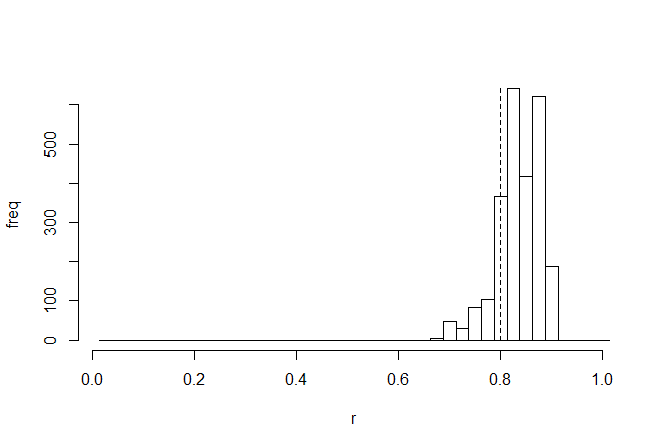 Parameter estimates from the posterior sample were not nearly as close on smaller trees. Awesome. In this case, the generating & estimated liabilities match very well. Note that the estimated liabilities are scaleless - so although in this case they match well numerically, this is because we generated the liabilities under σ(liability)2=1.0. If we had instead simulated liabilities under a model of, say, σ(liability)2=100 or σ(liability)2=1000, then we would expect the correlation to be equivalent, but the liabilities themselves would not be as well matched numerically. Cool. Next up - multiple states for the discrete character!